Currently, I am a mommy to two little ones. My house looks like a daycare; and if you have one or more children, chances are your house looks pretty similar to mine! Oh, how I love to see toys and books on the floor and throughout the house. It means that I have been blessed and that I have been given some of the best gifts imaginable!!! My children have toys, but they are not spoiled. We don't have every toy that has been on Walmart's shelves...and we certainly do not have the "new toys" that are usually all the rage during Christmas shopping season. But, we do have a few and my children play and play all day long! Surprisingly though, their favorite toys are cardboard boxes and empty plastic water bottles. You have heard the saying that if you give a child a present...they will play with the packaging more than the toy!! Sooo true! These days you hear so much about lead in toys and dangerous paints and toxins found in materials used to make toys...that you just want to throw out ALL your toys and find a tree branch for your children to play with. Toys just aren't made like they used to be made and sadly, care isn't taken when considering what they are made of. Today, all of that is about to change. I have the privilege of introducing you all to Green Toys! Yes, I said GREEN TOYS. Green Toys are toys that are made out of recycled ingredients...the main ingredient being milk containers! Collected at the curb by the recycle truck, those jugs are sorted out and reprocessed into super clean and fresh plastic! The packaging of Green Toys is also made out of recycled, corrugated boxes and contain no plastics, twist ties (don't you HATE trying to get toys out of the 8 million twist ties that fasten them down????) and cellophane. I love it!! We believe the world would be a much better place if everyone said “please” and “thank you", cell phones didn’t ring during movies, and all toys were fun, safe, and made from environmentally friendly materials. Since it’s probably no use holding our breath for those first two, we’re concentrating on the toys. Green Toys Inc. makes an awesome line of classic children’s toys constructed from recycled plastic and other environmentally friendly materials. This helps reduce fossil fuel use and reduce greenhouse gas emissions, improving the overall health and happiness of the planet. All Green Toys products are 100% made in the USA. To be more specific, they are produced in California, a state known for strict toy safety and environmental laws. It's cool to buy USA, but also think about this: transportation is one of the biggest contributors to greenhouse gasses. We all know driving less is good for mother nature, but did you ever think about how many miles a toy logs before it ends up in your local store? Our toys are truly local creations. Every step in the process, from milk container recycling to toy production to final assembly, occurs in California. Our raw materials and toys aren't shipped from overseas, which saves a lot of energy and reduces greenhouse gasses. It also guarantees your toys won't get seasick before they get to your home! I love how these toys are made in the US. It gets so tiring to constantly read "Made In China"...nice to have an eco-friendly toy company right here in our own United States!! So, for this review I was sent a set of Green Toys Stacking Cups. I don't know about you but I am a HUGE fan of stacking cups!! They are so great for babies to learn different shapes, depths and colors. They are also fantastic for learning how to count when baby gets older. These particular Stacking Cups are multi-colored in blues, purples and greens and have a number stamped on the inside. I am the type of parent that likes to build towers out of toys like these...and in the process of stacking them upside down to create my tower, we count "1, 2, 3, 4...etc". This helps them to understand counting and numbers. True to the description, the packaging was very simple to get into...there was no tearing of plastic or snipping of twist ties. I simply unfolded the cardboard and my toys were ready to go into my children's eager hands. It was great! These Green Toys Stacking Cups will also work very nicely for bath toys. We love baths around here and can never seem to have enough toys for the tub! Green Toys Stacking Cups can be found on Green Toy's website and can be purchased there as well for $10.99. Along with these cups they also carry dish sets, play food and teethers...all of which are fabulous toys! Visit Green Toys, then come back here and leave a comment letting me know what toy you would love to win. :) You do not have to be a blogger to enter, but you must have a valid email where you can be reached should you win. If you do not leave an email address, it must be where I can easily find it. This giveaway is open to US residents and will end 8/10 at 11:59 pm EST. The winner will be chosen using random.org and will be notified by email. The winner will have 48 hours to respond, or another winner will be selected. 1. "Like" Green Toys on Facebook. 2 entries, so 2 comments. 4. Become a GFC follower of My Opinion. Leave a comment to let me know that you did/ do. 3 entries, so 3 comments. 6. Tweet about this giveaway. Leave a comment with the link. 1 tweet per day. 1 comment per day. 8. Leave a comment on any review only post. 1 entry per post commented on..tell me the name of the post on which you commented. Unlimited. 9. Add this giveaway to a linky. Leave me the link to the linky list it was added to. 1 entry per linky. 10. Blog about this giveaway. Leave me a DIRECT link to your post. 5 entries, so 5 comments. Disclaimer: I received no monetary compensation for this post. I did receive Green Toys Stacking Cups for review purposes. All quotes and stock photos are from the Green Toys website and email. All thoughts and opinions are 100% mine. I like the Pizza Parlor. signed up for email alerts rom green toys. i'd also love their blocks for my little guy! I also like their dump truck. I follow you via GFC #1. I follow you via GFC #3.
would love the tea set! The Tool Set looks fun! I follow Greentoys on twitter as ptowngirl. I follow you n twitter as ptowngirl. I love the colors of the stacking cups! I also really like the Twist Teether. It looks fun for baby to grasp. I follow Green Toys on twitter @Aerated. I follow Green Toys on twitter @Aerated #2. I subscribe to Green Toys. I follow with GFC #3. I like the Pizza Parlor set.....so cute! Following Green Toys on twitter. Subscribed to Green Toys Email Updates. the sandwich shop set looks awesome as well. I love the Green Toys Tea Set. So easy to do since I have already purchased the dump truck for my grandson. 2. Follow Green Toys on Twitter. 2 entries, so 2 comments. 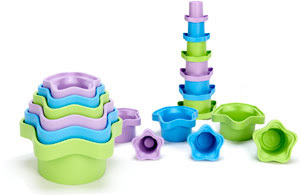 LOVE the twist teether & stacking cups!!!! I love the Tea Set! I would love the Green Toys Pink Dump Truck. I like the "Green Toys Stacking Cups" best. I don't have children, but these toys are perfect for my rabbit, Charlie. He loves knocking over towers of toys, but it's hard to find toys I feel safe giving him. These, though, seem lovely. They have the cutest toys! I love the Tea Set, too! I like Green Toys on FB! I follow GreenToys on TWitter! Enter to win a Lil' Diner! FREE Slurpee at 7-Eleven ~TODAY ONLY! Ritz Crackerfuls...A Taste Of Summer! FREE Meal at Chick-fil-A on July 8th! Enter to win an IntelliGender Kit! Sprucing Up My Living Room!